This Valentine’s Day, why not show some love with heart-shaped lollipops? 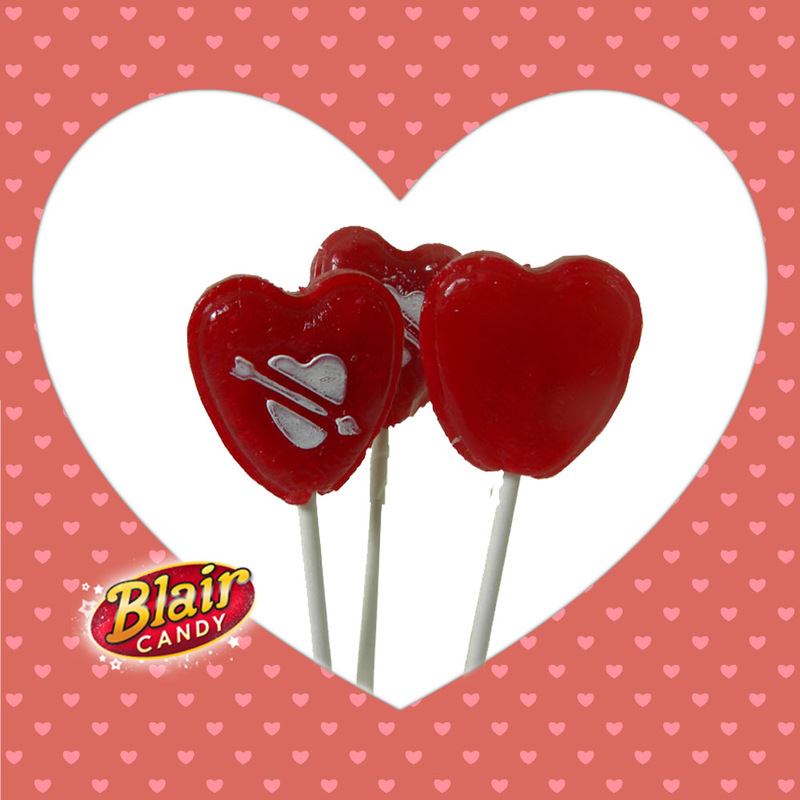 At Blair Candy, we have quite the selection of heart lollipops for people of all ages to enjoy. Whether you’re looking to purchase treats for co-workers, a classroom of students, or anything in between, we have several types to choose from! Show your love with Jolly Rancher heart-shaped lollipops. Just as tasty as the original hard candies, these Jolly Rancher lollipops will warm the hearts of those who receive them. Available in pink lemonade, cherry, watermelon and apple flavors, there are 20 pops per bag. Each lollipop is individually-wrapped. Additionally, every wrapper is printed with a heart-shaped blank space for conveniently writing the name of your crush, or recipient, right on it! Next on the list of heart-shaped lollipops are cherry-flavored and made by Charms! Each bag contains 21 individually-wrapped suckers, all sporting a small white heart with an arrow through it on one side. Perfect for treating a class during a Valentine’s Day celebration or any time of year, as a staple of any wedding candy buffet! Another heart-shaped favorite are Albert’s Sweet Swirly Suckers. Designed with pink, red and white swirls, these pretty pops taste even sweeter than they look. Each box of Sweet Swirly pops comes with 24 sticks of lovely, swirly goodness. To maintain freshness, each pop is individually wrapped. Did we mention the wrapper comes with a removable Valentine’s Day sticker, too? Sweet to eat and treat others, these pops are sure to please! This year, Cupid’s got nothing on Blair Candy! Shop today for the Valentine’s Day candy that will have you falling in love all over again! Valentine’s Day is just around the corner, so once again it’s time to think about what kind of sweet treats your children should take to school for classroom celebrations. From Valentine’s cards to candy, the students exchange it all. But what about the teachers? Don’t forget about your child’s teacher or instructor; they like to receive goodies, too! This Valentine’s Day, R.M. 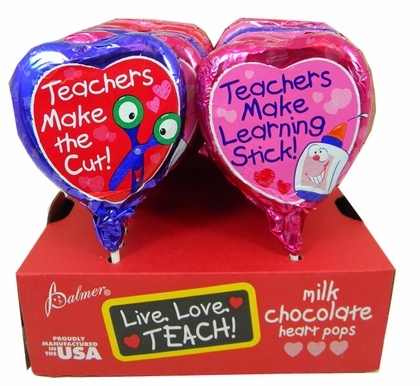 Palmer Company makes it easy for you to show appreciation to teachers. Their 18-count foil-wrapped chocolate heart lollipops are a sweet gift, in more ways than one! Each wrapper comes with a cute and memorable expression to show them how much you and your child care about what they do. Some are even humorous teacher-specific puns, sure to brighten any teacher’s day. Place your Valentine’s Day candy order now and beat the last-minute rush! And most importantly, don’t forget to spoil teachers on February 14th. They like a sugary reprieve from their everyday routine as much as their students do!